The Kentucky congressman that represents the parents and mentors of the Covington Catholic High School boys involved in an incident in Washington that subsequently went viral on Saturday says the teachers and parents ‘should be proud, not ashamed,’ of their kids’ behavior. 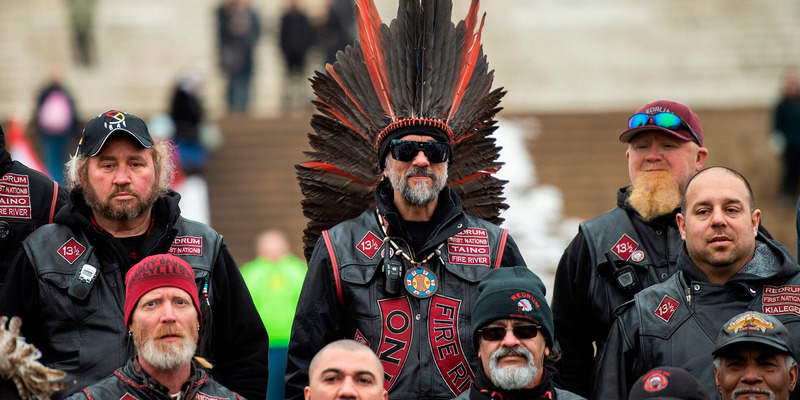 The US has been in a heightened state of social media uproar since Friday, after students from the Kentucky all boys high school were accused of harassing a Native American man in a public stand off in Washington, DC. Kentucky Republican U.S. Rep. Thomas Massie of Kentucky’s 4th Congressional District has taken to Twitter in an extraordinary defence of the students from Kentucky’s Covington Catholic High School, who were filmed on Friday surrounding and chanting at a Native American activist Nathan Phillips in Washington DC. 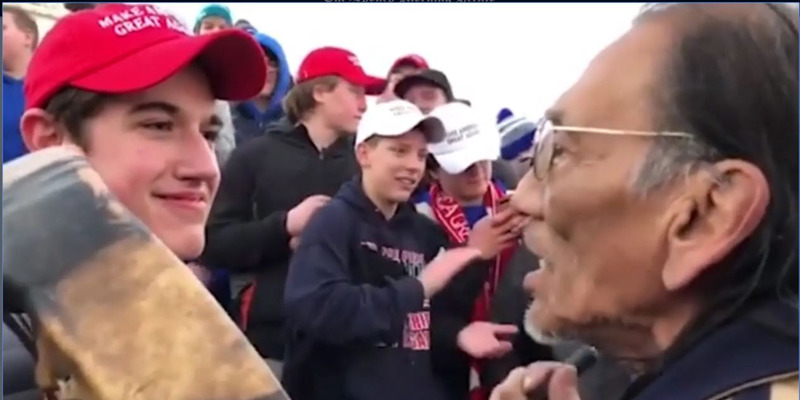 In what has quickly become an iconic image of a modern America divided, a teenager wearing a “Make America Great Again” hat smilingly stares just inches from the face of Phillips as the Vietnam veteran beats a drum and sings the “American Indian Movement” song. The images have been shared worldwide and sparked intense debate, fury and abuse as social media users, politicians, commentators and punters offer their interpretation of the scene. Few comments have been as systematically and staunchly supportive of the teenagers as those made Sunday night by the conservative lawmaker from Kentucky. Massie represents Kentucky’s 4th Congressional District which stretches across Northern Kentucky and 280 miles of the Ohio River, including Covington. 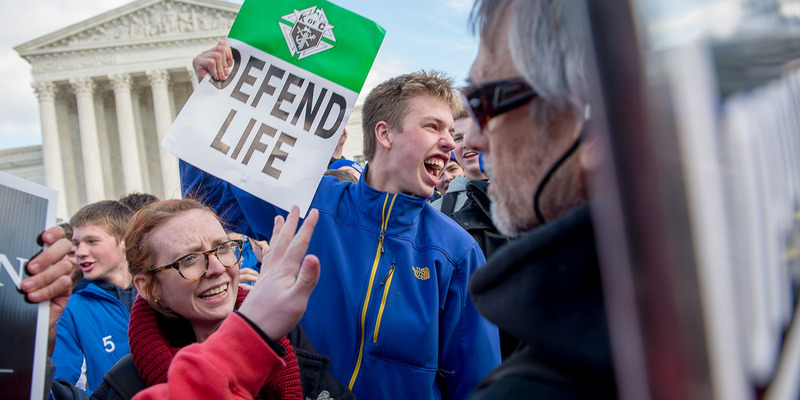 The boys, quickly identified as Covington Catholic High School students had traveled from Kentucky to attend the March for Life, an annual anti-abortion demonstration at the capitol. Wearing “Make America Great Again” hats the boys are recorded from several angles surrounding a small group of protestors in front of the Lincoln memorial. In several videos posted to social media, a smirking boy stands face-to-face with a protestors as the large group giggles, jeers, and clap. The UK Daily Mail also reports that a Covington student has since claimed that Phillips has a history of racial vilification claims and forced his way into their “cheer circle” as a publicity stunt. On Sunday, Massie describes the “honorable and tolerant” students as the victims. “Would you have remained that composed at that age under those circumstances?” Massie rhetorically asks, without detailing the sources of the brutality. Separate video of the incident showed a small group of black protesters arguing with some of the crowd members before Phillips intervenes. Despite the widespread and often visceral condemnation of the incident, Massie encourages the responsible parents and mentors of the boys – curiously absent during the incident – to be appreciative and gratified by their charges and their behavior. “We extend our deepest apologies to Mr. Phillips. This behavior is opposed to the Church’s teachings on the dignity and respect of the human person. The matter is being investigated and we will take appropriate action, up to and including expulsion,” the school added in a statement on its website. INSIDER reports that a mother of one of the kids who wrote to Heavy.com said that the boys were provoked by a group of men who had been protesting before the Native American group arrived. “Did you hear the names of the people were calling these boys? It was shameful. Did you witness the black Muslims yelling profanities and video taping to get something to further your narrative of hatred? ?” the woman wrote, according to Heavy.com. The protesters have been identified as members of a group known as Black Hebrew Israelites, which is unrelated to Islam. Last week in an interview with Fox Business Channel, Massie defended US Rep. Steve King following a national backlash regarding King’s widely panned comments on white supremacy. “In my presence, he’s never said anything racist and so I’m not ready to censure a man based on a New York Times article,” Massie said. Massie is a staunch social conservative and deficit hawk who often calls for government spending cuts. He was first elected to Congress in 2012.